Iraq's independent electoral commission says statistical irregularities in last week's referendum could indicate fraud. Chief electoral officer Adel Alami did not give details, but he said many provinces' figures were either too high or too low by international standards. A source told the BBC both the turnout and result levels were of concern. The electoral commission said on Monday it was re-examining the ballots and that final results from the referendum would be delayed by several days. Earlier, United Nations election officials in Iraq said the vote had gone well, but some Sunni Arab politicians have alleged corrupt practices were allowed to boost the "yes" vote. Election officials also queried US assertions - later retracted - that the draft constitution was likely to be approved. During her visit to London last week, Secretary of State Condoleezza Rice said initial information from the field indicated the constitution would be backed. Hussein Hindawi, an official at the commission, said he was "surprised" by the statement. "As far as I know, she does not work at the Independent Electoral Commission of Iraq (IECI)," Mr Hindawi added. Karina Parelli, head of the United Nations Election Assistance Team in Iraq, also questioned Ms Rice's comments. "Unless Rice is more well-informed than the IECI, thus far there is no way to know the turnout percentages or the results of the voting," she said. The IECI said votes in several governorates required "re-examination, comparison and verification because they are relatively high compared with international averages for elections". The commission said in some areas nearly all votes indicated a "yes", and in others a "no", and that in such circumstances the ballots would have to be audited, in line with international practice. The count was also disrupted by a sandstorm that blew up in central Iraq, preventing ballots from being flown to Baghdad for counting and slowing their progress on the roads. The result was originally expected later this week, but the electoral commission warned it might now be put back several days. On Sunday, unofficial results leaked out suggesting that the referendum would be endorsed. There were indications that Shia and Kurdish areas had voted heavily for the constitution, while opponents may have got the upper hand in only two of Iraq's provinces, not the three they need to veto the charter. The Associated Press cited an anonymous official saying that heavily Sunni Anbar and central Salahuddin provinces had rejected the treaty by the required two-thirds. 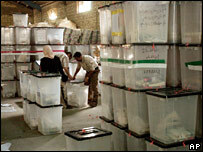 But Ninevah and Diyala provinces, which are thought to have slight Sunni majorities, appeared to have voted in favour. Saleh al-Mutlaq, a prominent Sunni Arab politician, alleged vote-rigging in Diyala, saying soldiers had removed ballot boxes and that there had been more votes cast than registered electors. There was international approval that the vote went ahead relatively peacefully, and that turnout was high, even in Sunni areas where some groups urged a boycott. US President George W Bush called the high participation "a positive development", and said it showed that "people are willing to try to work out their political differences through a process, a peaceful process". One place where few people appeared to have voted was Ramadi, west of Baghdad, where militant activity has been high. On the day of the vote, five US soldiers were killed in a roadside bombing in a village near the city. US helicopters and warplanes bombed the same area on Sunday, killing about 70 militants, the US military said, although eye-witnesses said many of the dead were civilians.